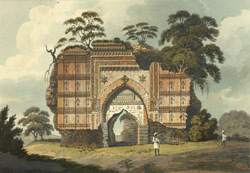 bl.uk > Online Gallery Home	> Online exhibitions	> Asia, Pacific and Africa Collections	> The Cha'nd Gate [Gaur]. Coloured aquatint from a painting by Henry Creighton, engraved by Thomas Metland, and dated to 1817. The ruined city of Gaur was surrounded on all sides by numerous darwazas or gates. Erected in around 1466 this gateway was situated within the walls of the fort after passing through the main gateway or Dakhil Darwaza. It comprises a central arched opening within the brick-built defensive gate. Its surfaces are alternately recessed and projected and decorated with relief terracotta panels in predominently foliate designs.